I have a seemingly simple problem while developing a Module which I just can't wrap my head around. When I use the Modelio GUI to create an Enumerated Property Type in the LocalModule, it is really quite straight forward. I create the Type, add some literals and use it later in a PropertyTableDefinition Property. 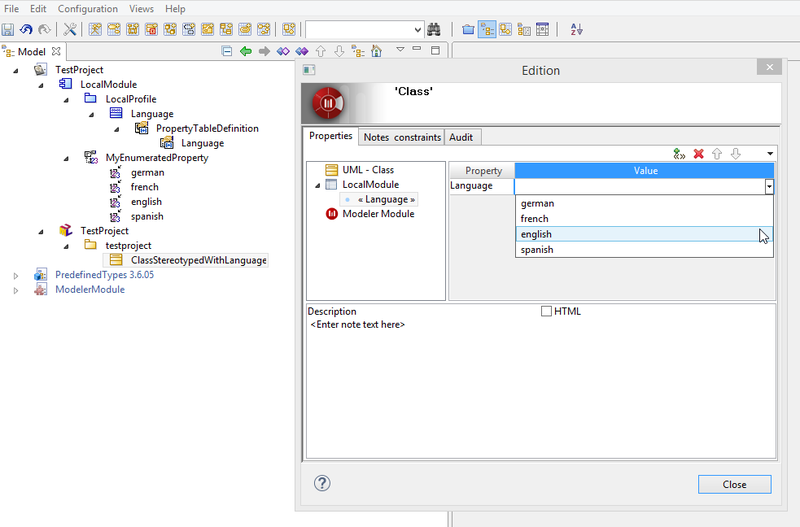 When I apply this Stereotype to a class in the model, I have a nice drop down with the literals available. Exactly what I need. Great so far. But now I want to publish a profile containing such EnumeratedPropertyTypes in a Module. The problem is: I cannot figure out how to do that in the module.xml file. I've tried a multitude of nodes in the xml but so far, the build process has always deleted them. So here's my question: How can I use these Enumerated Property Types in a Module? Is it possible for you to post a very simple example, maybe even the one shown in the image? Any help would be appreciated. But I am still not quite sure how to add a PropertyTableDefinition with a Property of type "MyEnumeratedProperty" to the "Language" stereotype.